What!! Both days of the weekend windy, you gotta be joking. But true. Not that it matters to a man of leisure. Yesterday totally amazing, I arrived late and missed the boys, went 12m to Towra from Hollywood, played a bit but was overpowered. 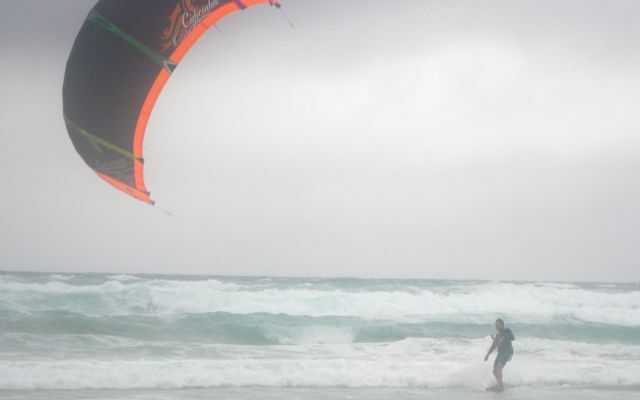 If I'd been on ANY OTHER kite I couyld have self-landed on the beach and changed the knots. But not the bloody IDS. No easy self-land on a specific point, just chaotic downwind hope for the best stuff. So anyway that turned out to be a good thing as it sent me back tot he mainland to swap to my 9m. nice little sess, with Daz the Irish Kiter, trying to improve upon my crappy raileys. The alone which I love out there, til I got tangled! Today I was back but timed it totally wrong, arrving at 2ish and leaving at 4ish just as it went green. BUT, that was a blessing as it made me go out on the surfboard, 6'10" normal surfboard, strapless. Dunno why I'd not done it earlier! 12m, over to Towra, played with Jase, then back to Scarborough in a rush to get back, but dropped my kite - very northerly so wind lulls near the shore line - then struggled for a while to find my board - thought it was upwind of me, so I bodydragged half a beach before I realised it had been downwind of me! Rush rush rush home home home. 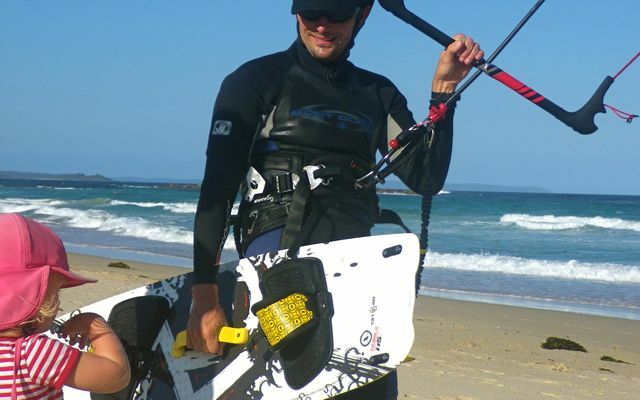 Big day yesterday ... Long afternoon waves session at Long Reef, to myself early on, then the hoards (well, 10 kiters total) arrive at 5ish for after-work sessions. 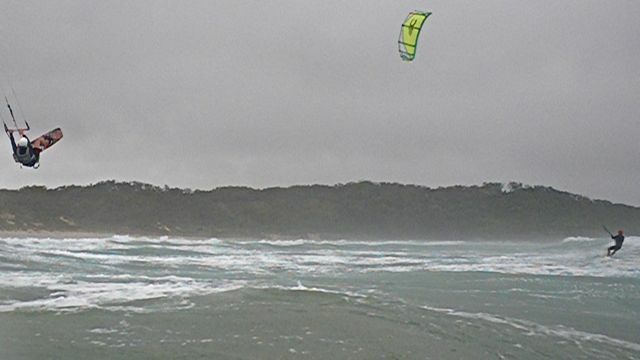 This was a massive swell and 15-30kts SSW-ish wind day. Very gnarly gusty hectic both the water and the waves, loads of fun though. Did twinny, and SRT. Then back south of Port Jackson to our southerly evening wave spot. What with a surf in the morning as well, I woke up unable to walk this morning. An epic session at Caves ... Protocole wanted to kite Caves for years so nice to knock that one over. Onshore 25+ knots, stunning spot, place to ourselves. Had a ball in the messy waves, loads of air ramping off the incoming waves, loads of fun playing with "surfing" the waves on my twinny, real confidence building sess. Things clicked even for Cuspy, on his 10m he's a different man to the 13m tank he normally flies. Got some pics too. Kited til dusk. Actually til delirious. Alive alive fun fun this is what its all about. We woke up to wet tents and unhappy muddy campers, wind lighter and slightly offshore at Huskisson so made another dash for Caves to get the best of it facing the open ocean. 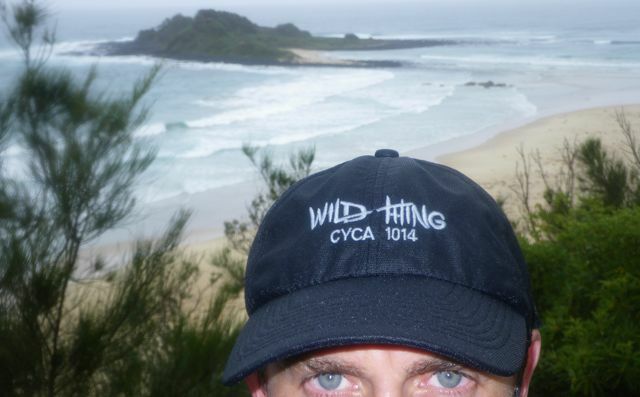 Slight west so wind shadow at Caves west-end, so took the 1km bush walk to Bherwerre Beach. Again, what an amazing spot. I am continually staggered by how spoilt we are with such amazing pristine and empty beaches to play with so close to Sydney. Hard work this one - compared to the ego-sess the night before (as one gets from perfect wind). Struggled to get out on 12m kites, but once thru the break all good. Again, nice wave skill developing. Got on the SRT (directional) but still can't jibe it properly. Cuspy struggled with the Tank, but I loved it. Got to showoff to some friendly grannies as well - "wish I was 40 years younger" - makes you realise you gotta do it while you can! End of the wind so glad we capitalised when we could - that's the thing with this sport - when its windy you just gotta go. Fine fishy cuisine ... 5 wet nights took its toll on the fam so we moved into a bt of luxury at Bannisters and some fine cuisine courtesy of Rick Stein. The hotel is on a great spot on the headland, I spent the afternoon watching the white caps build til I couldn't bear it any longer and got a little underpowered session in on Narrawallee Beach, with local kiter Glenn. Little waves. Few tricks. Things have really clicked recently, new gear makes a HUGE difference, you can't beat having confidence in your kit, and regular sessions means you don't forget everything in between! Loving this year off work!! What a beautiful session. I was plotting to go out in the 15kt ish rainy cloudy humid noreaster at Washerwomans Beach at Bendalong (a stroll from our campsite), while the fam were having their naps. But fortunately got chatting to a surfer who said the best spot in a noreaster is Cunjurong Pt, on the spit out to Green Island, he's seen a kiter there before, and it's good right now. 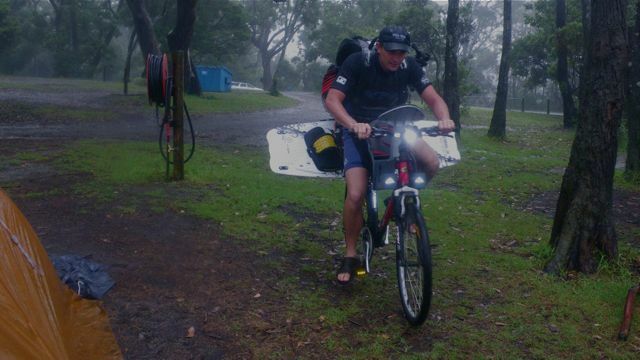 Two hours of that and I was starting to get a bit delirious, and the rain started hammering down, so I packed-up, no point in putting dry clothes on so wetsuited back to the fam on the bike.